When a new text is read for the first time on the Rhizome.org website, it appears on StarryNight as a dim star. Each time a text gets read again by any Internet user around the world the corresponding star gets a bit brighter. Over time, the page comes to resemble a starry night sky, with bright stars corresponding to the most popular texts in the database, and dim stars corresponding to less-popular ones. Dragging the mouse over one of the stars brings up a pop-up list of keywords that the corresponding text shares with other texts. 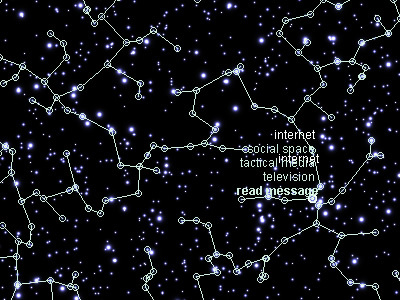 Select a keyword in the pop-up list to draw a constellation linking all the stars that share that keyword. 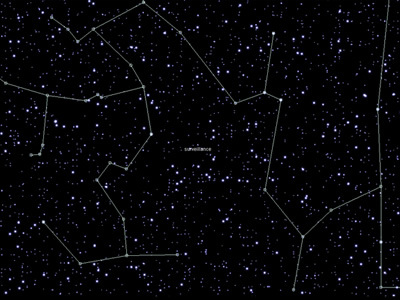 StarryNight depends on two pieces of original software: a set of Perl scripts that sort texts by keyword and record their individual hits, and a Java applet that filters this information to draw stars and constellations.